The 50th annual South End House Tour will be held on Saturday, October 20th. All tickets purchased before the tour date get a $5 discount. Purchase tickets below to take advantage of this deal! Note: After 6pm on Friday, October 19th, you can no longer purchase advanced tickets online. Purchase your tickets on the day of the tour at Sprogis & Neale Real Estate, located at 679 Tremont Street. Are you interested in taking the House tour and want to support the SEHS at a higher level? Become a sponsor! Individual sponsorships make up 1/4 of our revenue and ensures the success of the fundraiser. Purchase your sponsorship by Friday, September 8th for inclusion in our House Tour Guidebook. Do you own a business and want to sponsor the House Tour at the Corporate Level? Corporate sponsors get tickets to the tour, sponsor’s party, AND and advertisement in our House Tour Guidebook. General Admission Tickets can be picked up along with guidebooks the day of the Tour at Sprogis & Neale Real Estate, 679 Tremont St. All advance ticket buyers will be on the list. Sponsor’s Tickets will be mailed in advance to all sponsors unless otherwise notified. Want to learn more about the South End House Tour? Visit our FAQs below! 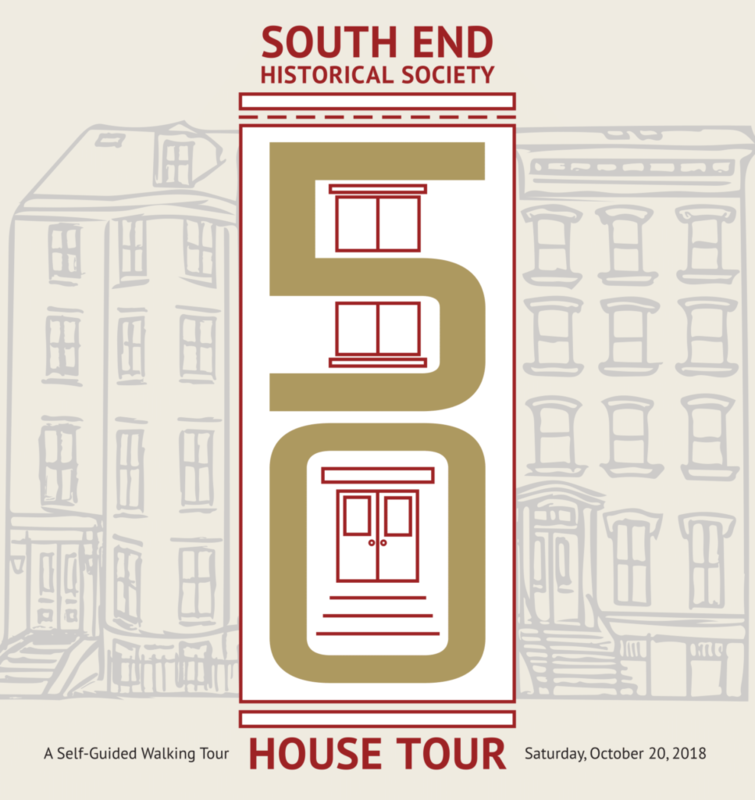 All proceeds from the South End House Tour are used to support the Historical Society’s ongoing efforts to preserve the neighborhood’s architectural integrity and to promote its rich social history.The House Tour is our biggest fundraiser. Fundraising provides one third of our yearly operating budget and ensures our continued operation. What is the South End House Tour? The South End House Tour is a self-guided walking tour of private homes and public spaces in Boston’s historic South End. Tour goers are given a ticket that gains them admission to the homes and a guidebook with descriptions of the homes and a map of the tour route so they can take the tour at their own pace. The South End House Tour is always held on the 3rd Saturday in October from 10 AM – 5 PM. For the average healthy person, we usually recommend allotting 2 hours to walk the whole route. However, the Tour does involve climbing stairs and the length of the route varies from year to year, so you might want to allow extra time if have limited mobility or just want to make stops in the South End’s many restaurants and shops along the way. General admission for the Tour is $30 if you purchase your tickets in advance (by credit card, cash, or check), or $35 on the day of the Tour. All tickets are available the day of the Tour at Sprogis & Neale Real Estate, 679 Tremont Street. If you purchased your ticket in advance, your name will be on the will-call list at the ticketing table. There are usually 5-6 homes on the Tour and 3 public spaces. Can I know which houses are on the tour? Unfortunately not. For the privacy and security of the homeowners who have so generously opened their houses to us, we do not release addresses or details prior to the day of the Tour. Please refrain from smoking, drinking, and eating in the homes.